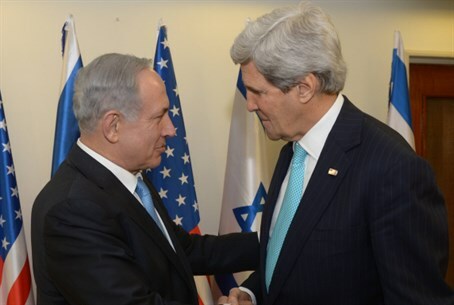 Where will Kerry be when Prime Minister Netanyahu addresses Congress? "Probably out of town", says his spokeswoman. Secretary of State John Kerry has already indicated he will not be meeting with Prime Minister Binyamin Netanyahu when he visits Washington to speak before Congress, but where will he be during the speech? State Department spokeswoman Jen Psaki on Wednesday told reporters that Kerry would not be taking part in the joint session of Congress which Netanyahu will address. When asked whether Kerry’s decision not to attend is related to the controversy surrounding Netanyahu’s speech, she replied that he will not be attending because he is “probably going to be out of town”. She would not elaborate. Reporter Matthew Lee of The Associated Press (AP) questioned Psaki on Kerry’s sudden travel and noted that “the Vice President also had some unspecified travel plans that would prevent him from being at Congress to hear the prime minister’s speech”, referring to the announcement from Joe Biden that he will be travelling abroad. “It just seems to be a little unusual that both the Secretary of State and the Vice President are – have determined right now that they’re going to be out of town or out of the country,” Lee said, at which point Psaki stumbled a bit, saying she believed Biden would be attending the inauguration for the new Government of Panama. Psaki did reassure reporters that Kerry and Biden’s lack of appearance at Netanyahu’s speech was not a snub. The speech has become a point of contention between Republicans and Democrats. Obama's allies fear the trip could be used by Israel and by Republicans to undercut ongoing nuclear talks with Iran. House Speaker John Boehner, who extended the invitation to Netanyahu, explained on Sunday that he felt it was important to do an end-run around White House "interference," amid a raging debate over whether to soften sanctions on Tehran. "I wanted to make sure that there was no interference," he said about his decision to issue the invitation to the Israeli leader.